The outdoors tarp is here, the green canvas tarp is now available at tarps plus in its best quality yet. The green canvas tarp works great for outdoor projects, to cover logs, yard supplies, lawn mower, what ever it may be that is exposed in your backyard that you want covered, the green canvas tarp is the tarp for the job. 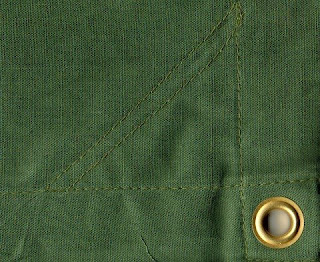 The green canvas tarp is 12 oz per square yard, 6.0 mil thickness, tear resistant and has grommets every 2 feet. The green canvas tarp also works great for outdoor activities such as camping, it can be used inside your tent as a carpet, it can be used to cover camping supplies, the usage for the green canvas tarp is endless. take a look at the green canvas tarp section on tarpsplus.com. HAHA Its funny how you mention it being used inside the tent, thats what i use mine for. I am purchasing more. Tarpsplus, my green canvas tarp is great!! Exactly what I was looking for. This canvas tarp is very thick and sturdy and lasted me almost three yrs! I will never get my replacement canvas tarps form anywhere else.Thanx Tarpsplus!!!!! The green canvas tarp blends right in to our backyard setting while keeping our firewood nice and dry.